The above photo pretty much says it all. We never and I do mean never take a shot without our shooting sticks. We carry them every season of the year. There is at least one set in the box of every truck we have. We use them for hunting and as you can see in the photo, we practice with them. The above photo was taken in 2002 in Caribou camp but it could just as easily have been on a coyote hunt or a gong session at the local pit. 1. Cut a length of hockey stick shaft or other hard wood 32" in length. The approximate dimensions of the shaft are 1" x 3/4". 2. Drill six holes of 3/16" diameter through the 1" dimension of the wood starting 2.5" from the top every 1.5" apart. Drill another hole 1.5" up from the bottom end but drill this hole through the 3/4" dimension. 3. Rip the 1" dimension in 1/2 with a table saw or skill saw to reduce the 1" dimension into two equal 1/2" pieces. Note the saw blade marks on the wood in the photo. 4. We cut a piece of drapery cord to support the bottom and to restrict the maximum spread of the legs. 18" with a knot at both ends works about perfect. 5. Install a 2" long 1/8" stove bolt through the hole with a washer and wingnut to the threaded end to secure the top. We use the 4th hole from the top for most of our applications but select the hole that works best for your height while sitting. 6. For optimum accuracy, we lean against a rock, fence post, tree etc. for added stability. Using this method, we can easily shoot 1" 100 yard groups with our varmint rifles and 1.5" 100 yard groups with our muzzleloaders. Give it a try. 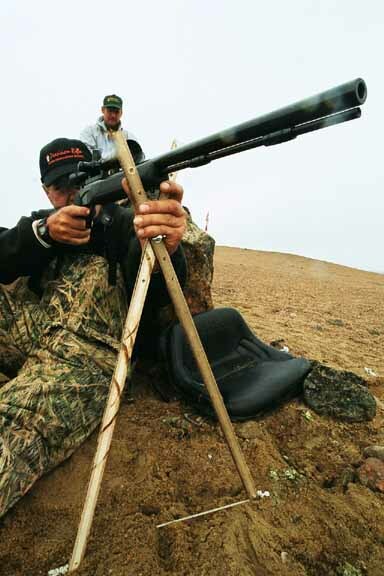 The fifteen minutes you spend building the sticks and $ 1 worth of material will bring your field shooting to a whole new level.